During pregnancy, you want to stay in shape and do what is best for your baby-to-be. Prenatal yoga is a wonderful way to do both. In our go-go-go world, yoga offers a much-needed opportunity to slow down and connect with your baby and with your body as it transforms. Whether you are new to yoga or are already an experienced practitioner, you can enjoy the many benefits of yoga during pregnancy. In yoga, it's often said that your body is different every time you get on the mat. You work on accepting that change is a constant. In pregnancy, this is doubly true. Yoga helps you reconnect with your body and embrace its journey. Prenatal yoga classes are a great way to prepare yourself for the birthing process and to enjoy the company of other pregnant women, fostering a sense of community that should not be undervalued. Many new moms' support systems and toddlers' playgroups have emerged from the bonds forged in prenatal yoga. Yoga during pregnancy has not received much scientific study, but it is generally considered to be safe and beneficial for most expectant mothers and their fetuses. If your pregnancy is considered high risk or you have other complications, talk to your heathcare team before starting yoga. Even if you have no special concerns, you will need to adapt your yoga practice as your baby grows. Your body produces a hormone called relaxin throughout your pregnancy that helps to make room for your growing baby and prepare for delivery. The presence of relaxin may make you feel more flexible that usual, but be careful not to overstretch; it's also possible to destabilize joints and ligaments during this time. The biggest danger to pregnant yoginis is falling. Therefore, minimize that risk, especially once your belly starts to protrude, by being careful with balancing poses. Skip any pranayama that could make you feel lightheaded to reduce the risk of fainting. Since Bikram yoga has been shown to warm the body's core temperature in certain cases, it should also be avoided. For first-trimester yoga, postural changes are minimal because the size of your belly isn't really an issue yet. It's most important to get in the habit of tuning in to your body. You may be feeling tired and nauseated, so give yourself permission to take it easy if that's the case. 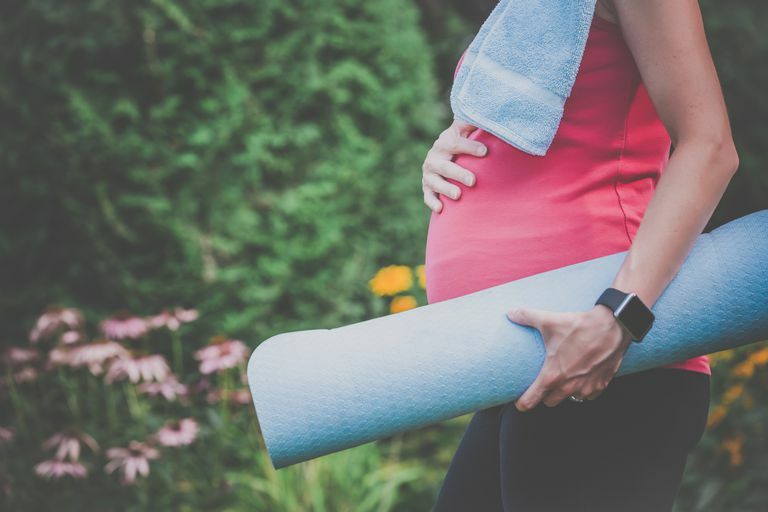 Most women who are already taking yoga classes can continue with their regular routines, though it's a good idea to mention your pregnancy to your teacher. If you're doing yoga for the first time, it's fine to start with a prenatal class. The second trimester is the ideal time to start prenatal yoga. You're probably past the worst of your morning sickness, if you had any. Your belly is starting to make an appearance, so you're in greater need of pregnancy-specific poses and advice. As your uterus expands, it's time to stop doing any poses where you are lying on your belly. Also avoid deep twists, which are not very comfortable at this point. In third-trimester yoga, your belly gets to be a big factor, prompting more adaptations to make room for it in standing poses. Taking a wider stance makes you more stable, which is helpful because you want to avoid anything that could make you fall. For that reason, inversions are discouraged at this point in the pregnancy. A 2015 research study was the first to monitor the fetus during the performance of yoga poses in the third trimester. It found no evidence of fetal distress in any of the 26 postures attempted, including downward facing dog and savasana. However, these poses may still feel uncomfortable at some point, and it's fine to avoid them. Many women who have never done yoga before find that it is an ideal form of exercise during their pregnancies and beyond. When looking for a class, stick to those labeled "prenatal yoga," as their teachers will be best able to instruct you appropriately. If you do go to a regular class, be sure to tell the teacher you are pregnant. Some women only have the opportunity to take up prenatal yoga in the third trimester. You will still benefit from the classes if this is your situation, but the earlier in your pregnancy you can start, the better. Yoga devotees will be happy to know that they can continue to practice throughout pregnancy. You may continue to take your regular classes as long as you feel comfortable doing so, but, again, make sure to let the teacher know you are pregnant. Never feel obligated to practice at your pre-pregnancy intensity. If you are a dedicated home practitioner, begin to do prenatal sun salutations. Study the above trimester guidelines to make sure you understand which poses to avoid. It's also a good idea to take some prenatal yoga classes to meet other moms-to-be and learn about childbirth. After you have your baby, you may be eager to resume your yoga practice. Doctors usually recommend six weeks of recovery time for new mothers after a vaginal birth and longer after a Cesarean section. When you have been given the OK from your healthcare practitioner and have no significant bleeding, you are ready to do postpartum yoga, whether on your own or in a mom and baby class. Certain poses help breastfeeding mothers combat back and neck aches. Pregnancy can be an exciting and special time, but it's also a bit mysterious. Yoga helps give you the tools to slow down and enjoy the experience by accepting and respecting the incredible thing your body is doing. Bonding time with other expectant mothers is another real benefit of taking prenatal classes. Even if you have a partner in your pregnancy, that person is not going through the physical changes that you are. Joining a community of pregnant women is a beautiful and valuable thing to do. Polis RL, Gussman D, Kuo YH. Yoga in Pregnancy: An Examination of Maternal and Fetal Responses to 26 Yoga Postures. Obstet Gynecol. 2015;126(6):1237-41.